207. Matissek R (2009) Sustainability! Bericht zur 16. Internationalen Kakaoforschungs-Konferenz ICRC 2009 in Bali/Indonesien. süsswaren 9+10: 12-15. 206. Raters M, Matissek R, W. van Haren, K. Fledderus (2009) Internationaler Proficiency-Test zur Bestimmung von Ochratoxin A in Lakritzprodukten. Lebensmittelchemie 63: 81-82. 204. Raters M, Matissek R (2008) Analytik gestern und heute – Über 100 Jahre Methodenentwicklung bei der Untersuchung von Kakaoschalen. Lebensmitteltechnik – Jubiläumsausgabe Dezember 2008: 20–23. 203. Raters M, Matissek R (2008) Thermal stability of aflatoxin B1 and ochratoxin A. Mycotoxin Research Vol. 24, No. 3: 130–134. 202. Raters M, Matissek R (2008) Analysis of coumarin in various foods using liquid chromatography with tandem mass spectrometric detection. European Food Research and Technology 227: 637–642. 201. Raters M, Matissek R (2008) Analytik von Cumarin mittels LC-MS/MS. Lebensmittelchemie 62: 82-83. 200. Raters M, Matissek R (2008) Thermische Stabilität von Aflatoxinen und Ochratoxin A. Lebensmittelchemie 62: 83-84. 199. Röder M, Ibach A, Baltruweit I, Gryters H, Janise A, Suwelack C, Matissek R, Vieths S, Holzhauser T (2008): Pilot Plant Investigations on Cleaning Efficiencies To Reduce Hazelnut Cross-Contamination in Industrial Manufacture of Cookies. Journal of Food Protection 71: 2263-2271. 197. Raters M, Matissek R (2007): Analysis and occurrence of deoxynivalenol (DON) in cocoa. European Food Research and Technology 226: 1107-1112. 196. Raters M, Matissek R (2007) Sensitive method for determination of DON in cocoa by means of HPLC-techniques. Mycotoxin Research 23 (4): 185-190. 174. Matissek R, Spröer PD, Werner D (2004) Bestimmung von Ammoniumchlorid in Lakritzerzeugnissen. Deutsche Lebensmittel-Rundschau 100 (3): 73-77. 173. Matissek R, Janßen K (2004) Shell content in cocoa products Part 4: Application of tryptamide analysis to chocolate. baking+sweets international 4 (1): 27-29. Vorkommen in Kakao. Lebensmittelchemie 57: 158. 171. 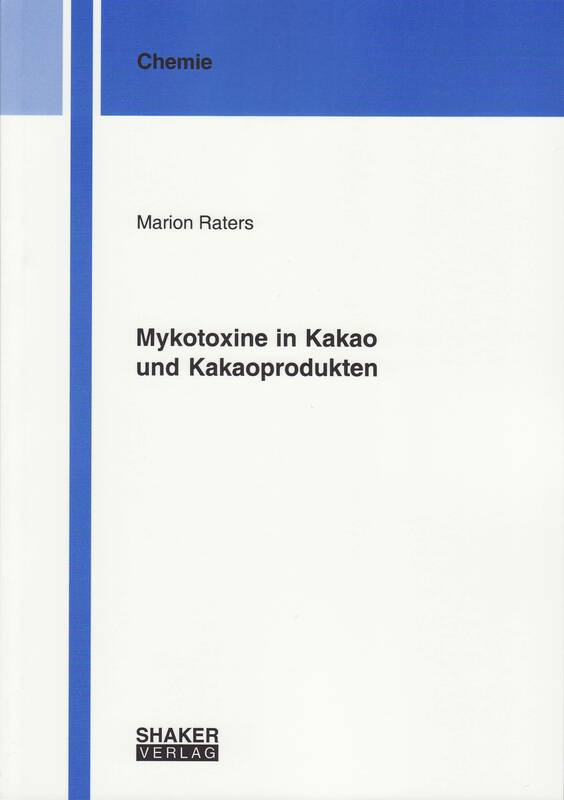 Raters M, Matissek R (2003) Untersuchungen zum Stoffübergang des Mykotoxins Ochratoxin A bei Kakaobohnen. Lebensmittelchemie 57: 157. 170. Matissek R, Janßen K (2003) Shell content in cocoa products Part 3: Correlation between the fatty acid tryptamide content in cocoa butter and the associated press cake. baking+sweets international 3 (4): 26-29. 169. Matissek R, Janßen K (2003) Shell content in cocoa products Part 2: Fatty acid tryptamides in cocoa nibs/liquors and cocoa shells. baking+sweets international 3 (3): 27-29.